How pleasant is the day when we give up striving to be young – or slender. While navigating through life’s inevitable challenges, we often increase our burdens by uncritically accepting prevailing definitions of success as our life’s goals. One incessantly glamorized success-definer is an ideal figure, which nowadays means a young, slender figure. Of course, we need to be healthy, and we would like to look good. But when looking good becomes an obsession, we subject ourselves to unnecessary torment. We adopt dubious dieting fads, swallow ‘fat-cutting’ magic pills and potions or undergo extreme exercise routines. Our mood goes up and down in inverse proportion to the reading on our weighing machine. Obsession with the ideal figure sentences us to hours and years of agitation and dissatisfaction. To prevent such torment, we need to protect our self-conception from becoming distorted by the social mirror. After all, the social mirror is fickle – what figure is considered ideal varies according to cultural and historical conceptions of beauty. Not many generations ago, several parts of the world considered a moderately plump figure attractive, for it indicated prosperity; a thin figure indicated poverty and was considered not so-attractive. Someone may argue, “But today’s social mirror is what matters for me.” Yes, and we can work to improve our figure as needed. But we needn’t let it become an obsession. We need the confidence that we are at our core far better than the reflection shown by the social mirror. Such confidence comes naturally when we cultivate spiritual knowledge. Wisdom-texts such as the Bhagavad-gita explain that we are eternal souls, different from our physical bodies. As we are eternal parts of the all-attractive whole, God, Krishna, we partake of the attractiveness of the whole. Presently, we can seek to increase our attractiveness in two ways – by working outwards to improve our looks or by working inwards to excavate our soul’s attractiveness. Working outwards gives at best ephemeral results. Bodily looks come with an expiry date, which can’t be extended much. In a materialistic culture, old people are frequently considered unattractive, unwelcome and unworthy. Hence, the fervent attempts of many senior citizens to look younger using hair-dyes and face-lifts. But it doesn’t work – even with the best of technology, the body’s degeneration remains unstoppable. In contrast, working inwards to manifest our soul’s attractiveness yields enduring results. Recognizing that we are souls and that our bodies are our vehicles, we focus less on how the vehicle looks and more on where we are going with the vehicle. When we live with spiritual purpose, we find inner contentment through our fulfilling inner connection with Krishna. Whatever our looks or age, spiritual knowledge paves our way to inner security and satisfaction. Thus breaking free from the compulsion to look good in the social mirror, we feel liberated – liberated to be ourselves. The Bhagavad-gita (13.10) indicates that knowledgeable people refuse to get carried away by the opinions of the masses. When we accept ourselves for what we are, we get enormous relief. 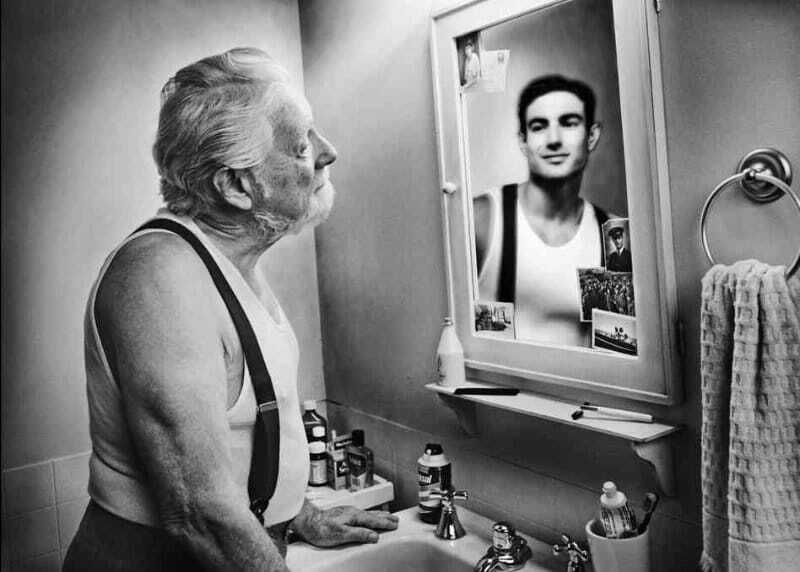 We stop wasting our mental energy obsessing over our looks – not that we become negligent about how we look, but that we become confident about who we are. Our spiritual self-confidence manifests in our conduct; we radiate the natural comfort and joy that comes from self-acceptance. Such comfort and joy, even if not glamorous or eye-catching, carry a charm that attracts the hearts of those who come close to us. And because this charm is not a show, but expresses our substance, it is sustainable. Naturally, relationships formed on the basis of our substance, not our appearance, are more real, more enduring and more fulfilling.